Inspired by the book and tv series “Feasting on Asphalt The River Run” by one of my favorite Food Network Stars Alton Brown (who just happens to live in Georgia) we decided to spend a few days in the Mississippi Delta on our way home from Little Rock. The book and tv series chronicle the journey he and his crew took on motorcycles on the Great River Road from the mouth of the Mississippi River in Louisiana to the headwaters at Itasca State Park, Minnesota. Pie was on our mind as we set out on a day trip to Helena-West Helena, Arkansas. Coconut pecan pie to be exact. Our goal was to visit two places featured in “Feasting on Asphalt”: the Delta Cultural Center (it was closed) and to try a piece of coconut pecan pie at Ray’s Dairy Maid. Just thinking about a pie with coconut AND pecans made my mouth water. We were probably the only non-locals stopping here for lunch. As we glanced around the small dining room trying to find an empty table, a couple sitting at a large table invited us to sit with them. They were a delightful couple from Helena. He is a retired banker and his wife Dolly is a hairdresser. She still does hair at the salon she has owned for over 50 years. They had just left the nursing home where she goes every Monday to fix hair for the residents there. They were regulars at the restaurant and seemed to know everyone. Ray’s Dairy Maid serves hand made hamburgers, plate lunches, and is famous for it’s homemade pies. 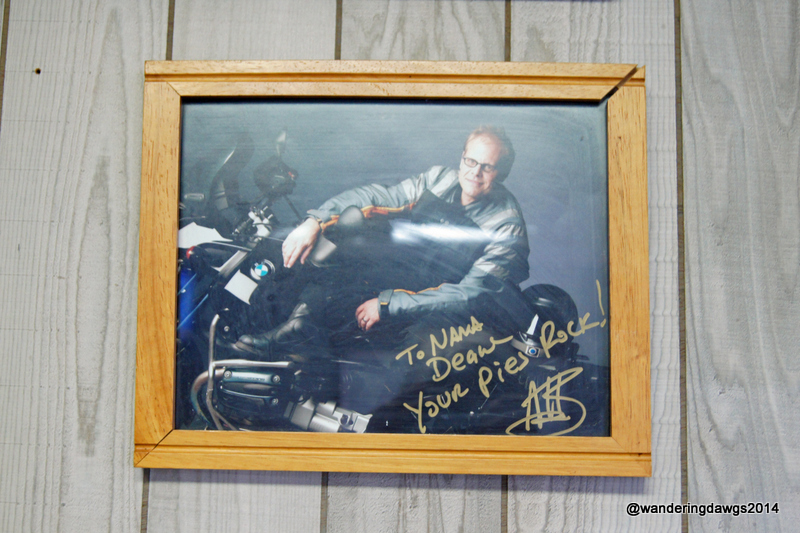 We didn’t get to meet the owner Deane Cavette (also known as Nana Deane) who was out of town. Every weekday they offer a different plate lunch special. Monday was meatloaf with 2 sides. Sounded great but I went for the country fried steak with fried okra. Good old home cooking at it’s best. Add good conversation to the good food and it was a lunch to remember. Dolly pointed out a meringue pie with the meringue piled several inches high. It looked delicious but we had been thinking about the coconut pecan pie too long to try anything else. After getting directions on how to get back on the road to the campground we got two pieces to go and were on our way. We had the pie for desert that night after our unbelievably delicious dinner of pulled pork from Jones Bar-B-Q Diner. The pie was even better than I imagined and was worth going out of the way for. Pecan pie is my favorite pie in the world and the addition of the coconut just put it over the top. It was a perfect way to end the day. I can’t remember a time when I’ve had two such delicious and memorable meals in one day. 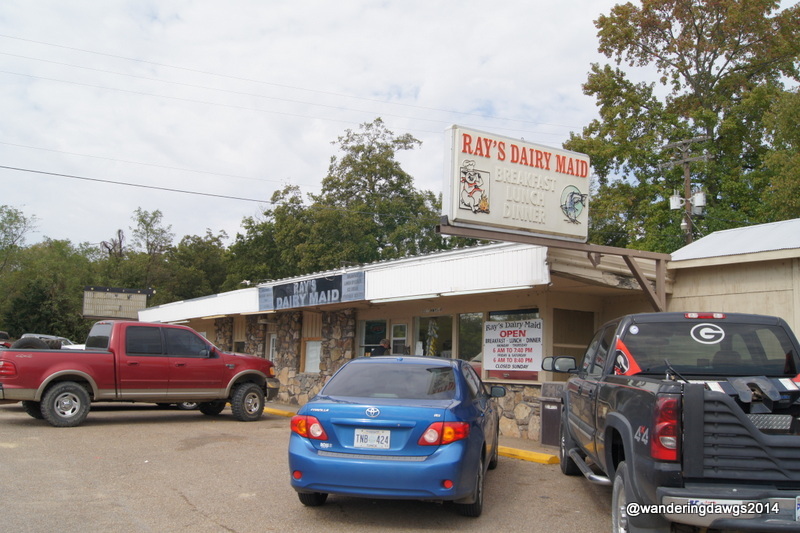 Ray’s Dairy Maid, Hwy. 49, Barton, Arkansas is owned by Deane Cavette. We were camped at Mississippi River State Park near Marianna when we ate at Ray’s Dairy Maid. Beth, Fred and I drove the Great River Road from Leland, MS to West Helena on Friday, Oct. 31. We stopped at the Mississippi Delta Blues Museum in Clarksdale, MS, en route to Blytheville, our destination for the night. I have a video of the houses on your street at BAFB. I couldn’t remember which was yours exactly, so I captured all of them. I’ll send Carol Jenkins a copy, or put it on FB. I wish we’d known about the Ray’s in Barton. We were so close. That sounds like a fun trip. I’d love to see that video! We watched a rerun of the series last spring. It wasn’t on Food Network and I don’t remember what channel it was on. There’s also a Feasting on Asphalt where he goes from the east coast to the west coast. I really enjoyed reading the book, too. Thanks Beth… I was on Amazon just now, looking for Alton’s books and videos. I am with you on the pecan pie with coconut–two of my favorites at the same time sounds too good to be true. Any chance of getting the recipe? You’re welcome! I hope you enjoy it.